Apple has released their Ipad 2, it is a beautiful tablet with power and intuitive design. So I spent a lot of time of Apple's website. Beautifully simple, that's how I would describe it. Something attainable with Google Sites. Many GS websites are simple too, but not so polished. I made this website from scratch. Nothing, including the nice tablet graphic is stolen, merely modeled. And I do not want to get in trouble so it is a software company draft. Please visit and enjoy. Google Sites, beautifully clean design. The "tablet" graphic is custom made with inkscape. I plan on making a video tutorial for this as it is easy enough for beginners and looks quite nice. 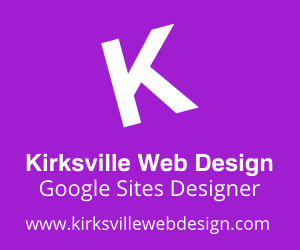 I have already used it on my homepage for Kirksville Web Design. I tried my best to create a sophisticated, not cheesy-looking, glassy navigation bar graphic. The graphic is part of the "wrapper background," nothing special. One thing I am particular sad about is the inability to insert an image and set that image to the background. So, graphics with text, as featured in the software company template, are really just graphics - you can't highlight and copy it (which would be nice for SEO). This is on my Google Sites wish list, which is way past-due. I most often use links, as featured in this template, for my style of the horizontal navigation. Links, as opposed to boxes and tabs, do no have a pre-determined image - just text - so you can easily create the look yourself. Anyways, the tip, create a url ink while in Manage Site>Site Layout>Horizontal Navigation. Instead of giving text in the field for a title, insert any amount of spaces. Now, it will not allow you to create the "link" without inserting a email or web address, so put something in there (it doesn't matter what it is). Now you have spaced out navigation (I put five spaces in between each of the links of this template). Hey, I'm a huge fan of mac/apple. I'd added a hover effect. I like the look, but I could go either way. Thanks for the comment. I really Like you site. very useful content. Easy navigational buttons are very important for websites so that the visitors would have an easy time navigating their site. Thanks. Thanks for sharing the template. I've search all over Google and I can't figure out how one creates a custom horizontal navigation bar. I assume that one creates the image, but how do you upload it into Google Sites and set it as the background for your linked horizontal navigation? Thanks very much for this tip - I just couldn't figure it out, well done! Great Tip regarding the spacing for the navigation bar! Thanks for sharing/teaching! Your website is full of great content! Thanks again! !